Drumagog attempts to replace the vibrant drumming session scene of old. Want the feel of a live drummer but can´t get the sound? Drumagog is your redemption. Impressive level of realism. Intuitive interface. Useful visual representation. Occasional latency issues. Ghost note feature still missing. Not exactly cheap. Drum beats are represented visually. Any newcomer to today´s music production scene could easily be forgiven for assuming that no one bothers with real drums any more. In a market awash with ultra-hip ROMplers and loop slicers, beautifully recorded sample collections and state-of-the-art drum machines, it´s no wonder that few home producers can be arsed recording the real thing. Apart from getting hold of a drummer and their drum kit, the microphones and engineering skill needed to do a good job of capturing them are out of reach to all but the most committed. Drumagog aims to take away at least half of that pain, enabling you to make quality drum tracks from even the shoddiest recordings. The basic principle is very simple: insert the plug-in into a drum track, load a set of multisamples into it and marvel as the transients of your rubbish-sounding drums trigger and are completely replaced by the samples. Drumagog doesn´t work on complete drum kit parts, just separate, ‘monotimbral´ tracks containing a single element of the kit (or sometimes two) -- frequency filtering algorithms just aren´t that intelligent yet. Most of Drumagog´s essential controls are located in the front-most of its three tabbed screens, along with the sample browser. This is divided up into bass drums, snare drums, toms and cymbals, with each category containing numerous bundled sounds that are easily added to with your own hits. Auditioning sounds involves nothing more than single-clicking them in the menu under the category header, and load times are pretty good, meaning you can blast through and find the sound you want quickly and easily. Many of the bundled sounds are multisampled and mapped across the dynamic range, so that if the incoming audio is quiet, a sample of your chosen drum being struck gently is used, while a louder trigger signals a sample of a harder stroke. The realism of this system is very impressive. Central to the Main screen controls are the Sensitivity and Resolution dials, which set the dynamic threshold and minimum length that incoming transients have to exceed in order to make Drumagog kick in with its own sounds. Anything under the threshold is gated out completely, unless Stealth Mode is used. Clicking the Visual button switches the Main screen to a real-time graphical display of the incoming audio amplitude, with draggable handles replacing the aforementioned dials. This lets you see exactly which hits are making it through and which aren´t, and gives an optimally intuitive interface for setting up the two most fundamental parameters. Aiding this further is the animated graphic of a drum or cymbal being struck, perfectly in sync with the sound. While this might look like a gimmick, it´s very useful, particularly when you have multiple Drumagogs open at once, giving a visual overview of your whole kit being played. 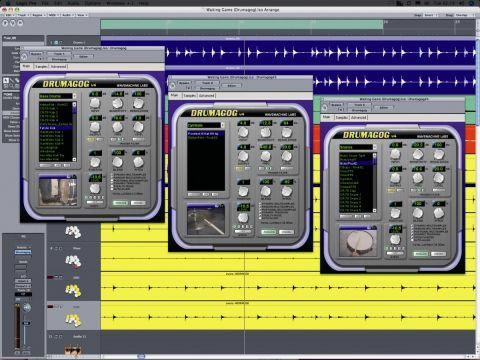 Once you´ve got a set of Drumagog drum tracks rolling, there are plenty of well thought-out ‘tailoring´ functions to tweak. Live drum tracks are never totally free of overspill, and Drumagog offers auto ducking to help alleviate the problem. Using an internal sidechaining system, you can send and receive signals between Drumagogs, up to a maximum of 16 groups. So if you had some snare spill in your hi-hat track that you wanted to get rid of, you´d simply tap off the snare track and send it to your hi-hat Drumagog, which will then drop the volume of its output by up to -96dB whenever the snare is struck. Related to this, a resonant filter is built in that lets you shape the signal before it hits Drumagog´s trigger stage. It offers high-pass, low-pass, band-pass and band reject modes, and features an Audition button so that you can hear what you´re doing with the rest of the plug-in bypassed. Another common situation with drums is having too few mics, and being forced to share them between drums. Stealth Mode enables you to set a threshold dividing the dynamic range into two halves, so that quiet hits are sent through unreplaced, while hits above the threshold trigger Drumagog. Great for keeping the hats and replacing the snare when both have been recorded on the same track, for example, and perfectly smooth in action. The Dynamic Tracking control acts like a sort of ‘tonal compressor´, determining how literally Drumagog tracks the incoming volume and adheres to it with replacement samples. Set to 100%, it´s fully responsive to dynamics; at 0%, it plays back the sample at the same volume every time it´s triggered. Drumagog is a bit of a studio standard on the quiet, judging by the testimonials on the website; and given that it´s the only thing out there that does what it does, that´s hardly surprising. It´s not going to be of any real use to those who only ever work with self-contained loops or drum machines, but for anyone recording real live drums with any sort of regularity, it´s a potential life-saver, enabling you to utterly transform your recordings and giving detailed control over the replacement sounds and the way they´re triggered. Problems? Well, certain functions introduce a bit of latency (Stealth Mode, most notably), but the software´s good at reporting this back, telling you just how much you´ll need to shift your tracks by to compensate. Also, Drumagog 3´s automatic ghost note feature has yet to make it into version 4, but apparently it´ll be along soon. And finally, you´ll have noticed that it isn´t particularly cheap. Having read this far, though, you´ll already know whether it´s the sort of thing your studio could benefit from or not.